In this tutorial we will look at how you publish messages using the Paho Python MQTT client. We will use an example python script to publish messages, process the publish acknowledgements and examine QOS (quality of service) settings. 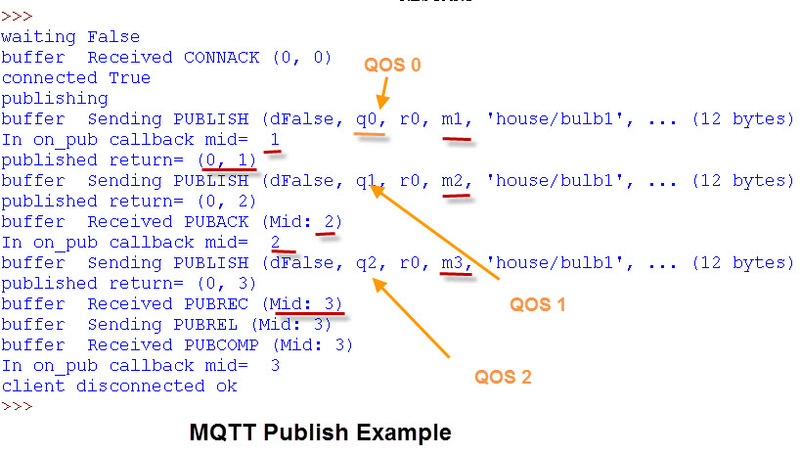 To publish a messages you use the publish method of the Paho MQTT Class object. Note 1: you don’t appear to need a client loop to process the on_publish callback. Note2: When you publish a message the publish method returns a tuple (result, mid). The result is the error code. A result of 0 indicates success. The mid value is an integer that corresponds to the published message number as assigned by the client. The mid value can be used with the on_publish callback to check that the messages was published. When the message has been published to the Broker an acknowledgement is sent that results in the on_publish callback being called. The client is the client object, and is useful when you have multiple clients that are publishing data. The userdata is user defined data which isn’t normally used. The mid value is the message id and can be used with the mid value returned from the publish method to check that a particular message has been published. In the screen shot below I have printed the mid value from the publish message and on publish callback. If you want to try and ensure that the subscriber gets a message even though they might not be online then you need to publish with a quality of service of 1 or 2. The schematic below shows the message flow between client and broker for messages with QOS of 0, 1 and 2. Notice with QOS set to 2 there are more messages generated. In addition messages sent with QOS of 0 are not acknowledged by the broker but instead by the sending client. You may not be allowed to publish messages on certain topics. This is controlled by the broker See Configuring Topic Restriction on Mosquitto. However what happens if you do publish on a restricted topic? Well as far as the client is concerned the publish succeeds, and if I run the previous script but restrict the topic then my client output would be identical to that shown above. Notice the denied publish message on the server console. Also notice the normal publish acknowledgement sequence. When publishing a message you can also set the retain message flag. This flag tells the broker to store the last message that you sent. If you only publish messages at infrequent intervals then you will probably want to disconnect the client between publishing. You can use the disconnect method along with the on_disconnect callback for this. This type of disconnect does not result in a last will and testament message. Although you can publish messages without starting a loop (See the Loop) you will need to start a loop or call the loop to send automatic ping messages. Therefore you may find that your client gets disconnected , and without the loop you don’t see the disconnect message. Therefore if you do this you will need to consider setting the keepalive to a higher value (60 seconds by default). Note: If you publish messages inside the keep alive value then the connection isn’t closed by the server/broker. You will need to add a broker/server CA key to the client, See Configuring Mosquitto for SSL for details about keys. You then use the client.tls_set function before you connect. E.G. Depending on how you’ve configured the broker you may need to use the TLS version parameter (code below set client to use TLSv1.2. Because SSL normally uses port 8883 you will also need to change the port when connecting. Q- Do I know if and when my published messages have been received by a client? A- No. You only know that the broker has received them, and then only if the QOS is set to 1 or above. Q- What happens if I publish on the wrong topic? A- Generally unless the topic has an invalid topic address you wont know. Q- What happens if I publish on a restricted topic? A- You wont know as it will appear to succeed. Q- How do I know that no one else is using that topic? A- You don’t. You could subscribe to the topic beforehand and look for activity. Q- Can I publish on any topic that I want to? A- Yes unless the broker administrator has configured topic restrictions. The Hive MQTT essentials series especially part 3 and part 4 for this tutorial. It receives the messages correctly but I cant get that client.publish to work. Can you give me some help? 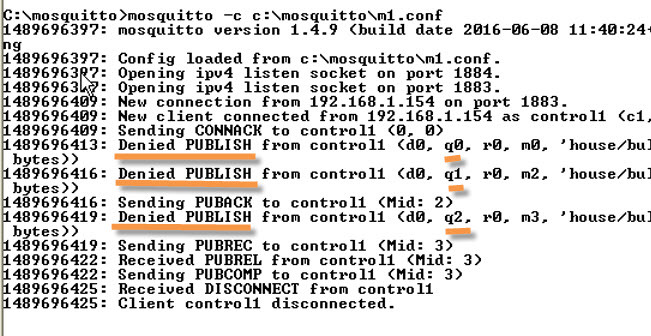 Messages published in 8883 port via TLS to a specific topic can be viewed in the 1883 port of mosquitto server in the same topic. Should that happen in a secure connection? Yes that is the way it works. The SSL connection is a link from the client to broker it is not client to client. You can send messages into the broker using standard MQTT and receive with another client using MQTT over SSL or Websockets etc. I’ve been unable to find out about publishing various payload types, like ‘comma seperated variable files’. I’m appending 4 integer variables to a CSV text file to be used as a payload. Have you any experience of this? I’m going to make a PayPal contribution from my company for all the help you’ve given me. The payload is sent as binary data and so you can transmit what you want. There are a couple of example tutorials and scripts that you might want to look at. If you still have problems let me know and I’ll help you with the code. I’m using the paho mqtt broker in Raspbian Linux, and the ESP8266 Arduino PubSubClient.h library. I’m getting a -2 result from the rc connection return code (connection refused due to bad client id). I’ve read about clientid being restricted to alpha-numeric characters, no symbols like dashes etc, and that they have to be utf-8 encoded. that you’ve used a regular ascii string to create the clientID. I’ve tried creating random clientID’s, but that requires a clean session to be set to true, and from the pubsubclient.h source code I don’t see the ability to set that anywhere. So best to avoid random ID’s. I don’t know if my arduino client library and paho broker are even compatible, but for now I’ll assume it is and the clientID string just needs to be understood. In your tutorial: “Paho Python MQTT Client Objects” it says clientID’s will be auto generated if the clientID parameter is left blank when clean session is set to true on instantiating a new client object. I don’t know if pubsubclient.h sets a clean session to true by default, or if it even uses that parameter. What do you know about guidelines/restrictions etc on naming of clientID’s that aren’t rejected by the broker?